I have made files in my mail program for information like this. One of the files is entitled “Info.” The other, “Important Info.” I don’t really know how I decide what info goes in what file. I need to clean out both files. I just don’t know when I’ll get to it. I’m already nervous about the writer’s conference I’ve signed up for. I have to retype the entire manuscript and I know me. I’ll have to rewrite everything at least half a dozen times. So I’m a little concerned that I may not get it done. And again, I know, I know—you have to turn off your inner editor, at least until you get the manuscript typed up. Then if I have time, I can go back and revise. But it’s difficult for me. I know I’ll think—I have to write this now or I’ll forget! Remember—my brain is like a garbage disposal . . . . I really didn’t expect to have this much anxiety. Once I get the manuscript typed I’m sure I’ll feel better. I feel like Indiana Jones when he stepped out into thin air. But the thin air was only an illusion. And when I feel this anxiety, thinking I’m all alone, that, too, is only an illusion. 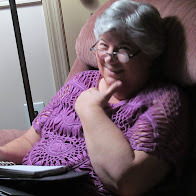 The American Christian Fiction Writers’ website posted an interview with Loree Lough. She ended the interview with a beautiful prayer for writers. Your can read it here. Just reading it again has made me feel better!